Caucasian Shepherd (Caucasian Ovcharka) Characteristics: The strong-willed and powerful Caucasian Shepherd, also known as the Caucasian Ovcharka, is a breed of large dog classified as a member of the Working Dog Group. The Caucasian Shepherd, is characterized by its athletic, powerful, muscular appearance with a large, wedge-shaped head and a headstrong, determined expression. Other characteristics include brown, medium sized, oval shaped, slightly slanting eyes; high set, triangular-shaped ears; a full, high set tail that drops to form a hook shape and an easy, unhurried gait. The temperament of the Caucasian Shepherd can be described as Attentive, Alert, Strong and Dominant. The coat type of the Caucasian Shepherd is described as thick coat in various lengths in assorted colors. Due to its characteristics and qualities, the Caucasian Shepherd demonstrated the desired traits of a Watch dog, Fighter and Farm Guard Dog and is known by its nick name the "Russian Sheepdog" and its alternative name "Caucasian Ovcharka". The origin of the Caucasian Shepherd breed was in Russia, Georgia, Armenia and Azerbaijan where it was developed in the Ancient Times. Caucasian Shepherd Breed Group and Dog Type - Working Dog Group: The Caucasian Shepherd is one of the many breeds of dogs that belong to the Working Dog Group. Other names for the Caucasian Shepherd: The Caucasian Shepherd is known by the nickname of the "Caucasian Mountain Dog". Other names for this breed of dog include the Giant Reds, Caucasian Ovcharka, Russian Sheepdog, Charka and Caucasian Shepherd Dog. The breed is also referred to as the Caucasian Shepherd in Europe. The word Ovcharka means "shepherd" or "sheepdog" in Russian. Origin of the name: The origin of the name "Caucasian Shepherd Dog" derives from its place of origin in the Caucasus mountains that are situated between the Black Sea and the Caspian Sea. Caucasian Shepherd History and Origin: The country of origin of the Caucasian Shepherd breed was in the the Caucasian regions of Russia dating back to Ancient Times. The first of the livestock guard dogs were the Caucasian Shepherd dogs that were used by nomadic herdsmen and shepherds from the Caucasus in the 6th century BC. The Caucasian Shepherd was found in nearly all the regions of the Russia including Georgia, Armenia, Dagestan, Astrakhan, Azerbaijan and across the North Caucasus steppes (grasslands plains, shrub lands and savannas). The powerful, robust Caucasian Shepherd were livestock guard dogs that protected domesticated animals from predators such as wolves, bears and jackals and drove away thieves and any intruders to their owner's homes. The Caucasian Shepherd differed from typical sheepdogs which helped shepherds and herdsmen to move, or herd, their flocks. The Caucasian Shepherd was highly protective and extremely wary of any strangers. The sheer size and power of the Caucasian Shepherd enabled them to charge at any enemies and knock them to the ground, where they would then attack them while they were down. The Caucasian Shepherd dogs were highly valued and were considered sacred by ancient Armenians who believed that their Aralez gods were dog-like creatures with powers to resuscitate fallen warriors and resurrect the dead by licking wounds clean. During the Caucasian War of 1817?1864, when Caucasus was invaded by the Russian Empire, the Caucasian Shepherd was used as guard dogs to convoys and camps and were also used in combat as attack dogs. Following WW2 (1939 - 1945) the Caucasian Shepherd went into decline but due to the efforts of cynologists (Cynology the study of matters related to canines or domestic dogs) the Caucasian Shepherd was revitalized. Although information is scarce and often conflicting we believe that the Caucasian Shepherd was used in Soviet breeding programs at the "Red Star" kennels to produce the Russian Bear Dog. Caucasian Shepherd Modern History: The modern history of the Caucasian Shepherd moved on and the breed is now used as a Watchdog, Guard Dog, Farm worker and as a military and police dog. Caucasian Shepherd Height: The Caucasian Shepherd breed is classified as a large sized dog. The height to the shoulder of a male dog is 64 - 76 cm ( 25 - 30 inches). The height to the shoulder of a female dog is slightly less. Caucasian Shepherd Weight: Not surprisingly for a large sized dog, the weight of a male dog is 36 - 80 kgs ( 80 - 180 lbs). The weight of the smaller female dog is slightly less than the male. Caucasian Shepherd Coat Type: The coat type is described as thick, water resistant coat in various lengths. Caucasian Shepherd Coat Colors: The colors of this dog breed consist of assorted colors consisting of white, gray, fawn, tan, pied and brindle. N.B. Brindle is a brownish or tawny color. Piebald are irregular patches of two colors, typically white and black and white. 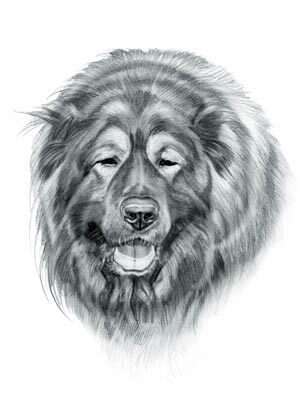 Caucasian Shepherd Grooming - LOW Grooming Needs: The grooming needs of the Caucasian Shepherd are categorized as Low in order to maintain a healthy, tangle-free coat and reduce the risk of skin infections. The limited grooming needs of the Caucasian Shepherd are considered to be low maintenance, requiring limited attention to grooming where brushing and combing, is concerned. Grooming Requirements should include bathing the dog on a monthly basis and making regular inspections of the nails, teeth, eyes and ears. Caucasian Shepherd Litter Size: The litter size of this dog breed ranges from 5 to 12 puppies. Caucasian Shepherd puppies for sale can be obtained reputable breeders and from rescue centers. The cost of Caucasian Shepherd puppies varies depending on location, pedigree history and the dog breeder. The female Caucasian Shepherd only gives birth once a year. Caucasian Shepherd Temperament and personality: The temperament and personality of this popular dog breed is described as Spirited, Alert, Strong, Dominant and Powerful. Caucasian Shepherd Exercise Requirements - HIGH Exercise Requirements: The exercise requirements of this breed of dog is high. The Caucasian Shepherd requires regular daily exercise consisting of approximately one to two hours each day. This large, powerful dog has an easy, unhurried gait with strides of a moderate length and requires a brisk walking speed or jogging by the owner to meet the dogs exercise requirements. Caucasian Shepherd Diet: A fully grown Caucasian Shepherd should be fed twice a day. A diet consisting of a premium dog food can be balanced with fresh food eaten by the family. The question is What Can Dogs Eat?. Check out our comprehensive list of what dogs can and what dogs cannot eat. Caucasian Shepherd Health Problems: Potential health problems of the Caucasian Shepherd breed include Cataracts, Hip dysplasia. Resolving health problems can prove to be expensive and it is always wise to obtain pet insurance or dog health insurance when buying a dog. Is the Caucasian Shepherd breed said to be Hypoallergenic? Answer: No. Caucasian Shepherd Lifespan: The life expectancy of dogs vary according to the size, breed of dog and any serious health problems. The typical lifespan of the Caucasian Shepherd breed is 10 to 12 years. Caucasian Shepherd Male Dog Names: Male Dog names are most often chosen to reflect favorite names of the owner or the strength, size, coloring and country of origin of the Caucasian Shepherd breed. To give you some inspiration regarding good male Caucasian Shepherd names our small selection might be of help with naming boy dogs. Our top male dog names are: Charka *** Ivan *** Taras *** Danya *** Vitaly *** Zeke *** Eugeny *** Rostik *** Cash *** Tikhonov. Caucasian Shepherd Female Dog Names: Female Dog names tend to be softer, prettier and reflect the temperament of the girl dog. Our top choice of good female Caucasian Shepherd names are Nastya *** Sasha *** Dasha *** Marina *** Vika *** Olga *** Sasha *** Molly *** Coco *** Taya *** Olena.